The warm weather, golden beaches, and calm shores of the Adriatic sea are just one reason that travelers are drawn Bibione, on the north eastern coast of Italy called “Venezia Orientale”. 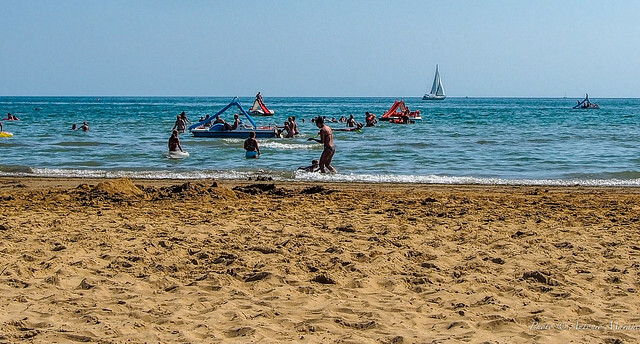 While taking a road trip through Tuscany or visiting the ancient city of Venice, which is the most popular attraction in this part of the country, vacationers seeking a more peaceful and relaxing beach experience head to Bibione. In addition, for travelers like us who look for a convenient, quality hotel just steps from the action, the Hotel Luna in Bibone is the place to go. With 11 kilometers of wide, soft, sandy beach, Bibione has an ultimate beach vacation atmosphere. The beach itself faces in the direction of the sun, and provides perfect all day sun exposure for sunbathers, like me. The calm and warm waters of the Adriatic sea are loved by all, and are great for playing around without fear of big waves. Families with kids will especially will enjoy the shallow waters. Activities and games can be found all over the beach, including dancing with the entertainment team. The area was the one of the first to introduce customer service on the beach — ready to assist you in any way possible so that you can enjoy your visit. I love the concept of a full service beach experience. In fact, you can send a request for customer service by phone text, and they will come right to your chair. How awesome is that?!?! And of course, safety is paramount here – with roughly 22 lifeguards stationed along the beach. With all of these activities and comforts on the beach, I can easily see myself laying there all day…every day of my trip. Just soaking up the rays, having a drink or a snack, playing some games…and of course, napping. It’s pretty much the exact thing you look for in a beach vacation. Much More Than a Beach – Sports, History, Art, Food & Wine! Of course, the main attraction in Bibione is the beautiful golden beach and turquoise water. And while many vacationers will just want to “veg-out” on the beach, others are looking for sports and other physical activities to help feel happy and healthy. The great thing about Bibione is that it’s also known for having a huge variety of sports and activities. From golf to nordic walking, volleyball, jogging on the beach, tennis, windsurfing, fishing…or even just relaxing with a low-key bocce ball game (our personal favorite for a day in the park or on the beach). Biking is also hugely popular in Bibione. In fact, there are bike trails all over Bibone and you can choose long or short trips. Head out to see the old lighthouse, or follow the maps and marked paths to other scenic spots – right along the beach front and to the town center. There are special “bike hotels” where you can rest, and restaurants with special menus. If you are a nature lover, you may also want to consider taking some short trips and excursions around the area. Possibly around the Lagoon or Valgrande nature areas. But if history, art and culture are your thing, then then take advantage of the close proximity to historic to famous and historic towns in the area. Towns such as Venice, Padua, Triste, Udine, and Treviso are just a few where you can experience Italy’s past, enjoy the art, fabulous architecture and wonderful food and wine. Our Gondolier during my first trip to Venice – he was quite the character! When we are looking for a hotel in a bustling destination like Bibione, it’s important to balance convenience and comfort. And the Hotel Luna does just that. This “all inclusive” hotel is located only 50 meters from the beach and pedestrian zones – so the hotel is in a great location. But beyond location, they a variety of unique amenities that guests will enjoy. The Hotel Luna is actually one of the few hotels in Bibione that has it’s own swimming pool! Personally, I love the option of having a pool too — because some days it’s nice to have a break from the salt and sand. They also have a solarium too, which includes a whirlpool and a geyser. Equipment rentals, include bicycles, are available at the hotel as well as a game room and recreation area for kids. A critical element for us (wherever we go) is WiFi access, which they have throughout the Hotel Luna…even in the solarium! So I can relax in the Solarium and work?!?! Love it! There is also a bar and restaurant onsite — neither of which charge extra service fees (a rarity in most resort areas…especially in Italy!). The onsite restaurant at the Hotel Luna provides service for all meals of the day, and guests can choose the all-inclusive package, so they don’t have to worry about anything. Just pop in when you are hungry and devour the savory dishes and desserts, and help yourself to beverages. In fact, the all-inclusive package is definitely something to consider if you want a completely stress-free vacation. It includes breakfast, lunch, dinner, a welcome gift, unlimited drinks, sparkling water, soft drinks and wine. Bicycles are included for free in the all-inclusive package, as well as reserved beach space with an umbrella and sunbeds! You get a discount on golf green fees (which is where you’ll find Josh, I’m sure), a there’s even a kids Europarty in the afternoon. As if those amenities aren’t enough, the famous Bibione Thermae spa is located just steps from the hotel. As many of you know, Josh and I love a good spa…so combining the spa with a beach vacation is the ultimate in rest and relaxation. With such a variety of activities for adults and kids, it’s easy to see that the Hotel Luna offers something for everyone to enjoy. Let Your Cares Slip Away As Soon as You Arrive! When we take off on a vacation, we’re antsy to let the rest and relaxation begin. So another perk that we like about the Hotel Luna is that they make it easy to get there. With transportation service to and from Marco Polo airport, as well as the main train station in Mestre or the nearby little train station in Latisana. If you are driving, then they also have indoor and outdoor parking available. These services really help ease the stress of arrival, and help get your vacation started off right. The Hotel Luna in Bibione is Great for Travelers Like Us! When planning a trip to Italy, people often think of historic cities like Rome and Venice, and dramatic coastlines like Positano. However, few realize that there are actually some fantastic beach resorts so close to these famous places. Bibione is a the perfect example. 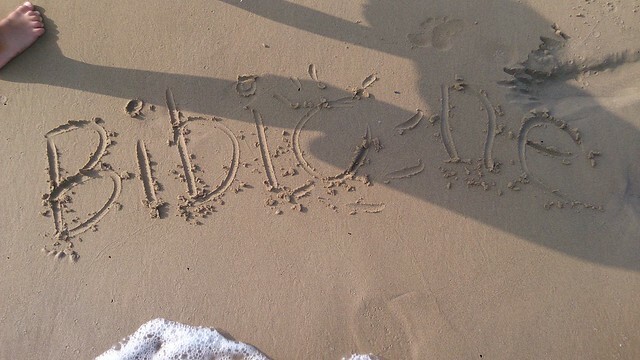 For us, we really love the fact that Bibione has so many of the things that we enjoy while traveling. While we are nuts for history, culture, and architecture, we swoon over beautiful beaches and spas. That’s what makes Bibione, and the Hotel Luna, such a great destination for people like us. When planning a trip and searching for a suitable hotel in a resort area like this, we are always looking for those little extra things that will make our stay that much more comfortable and enjoyable. With the convenient location and comfortable amenities, the Hotel Luna in Bibione ranks high on our list of places to stay in Italy. ** This was a partnered post and includes links to external websites.